Here is a “Thank-A-Coder” post to include STEM in everyday classroom instruction and observation. Nigel de Grey was a British coder during World War I. Like many coders, Nigel de Grey worked to break the codes that the enemy used to plan attacks, coordinate arms shipments, and discuss battle strategy. Also, like many coders, Nigel de Grey worked in the obscurity of Bletchley Park, in the cramped office known as Room 40. One hundred years ago, in 1917, Nigel de Grey hacked the coded text of the Zimmermann telegram. The Zimmermann telegram, sent from the German foreign minister Arthur Zimmermann to the German ambassador in Mexico. The telegram, written completely in code, urged Mexico to become a German ally and fight against the Allies in World War I. In return for becoming a German ally and attacking the United States, Arthur Zimmermann promised to cede the US states of Texas, Arizona and New Mexico to Mexico, along with large some of money, as a prize after the war. The codes used by the Germans were “exquisitely complex, so much so that the Germans assumed they could never be cracked.” Working at Bletchley Park, Nigel de Grey had to be hacked by hand since no computer existed (yet) to crack such complicated codes. 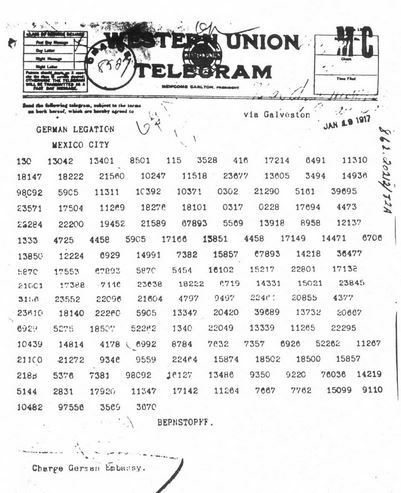 The decoding of the Zimmermann telegram greatly influenced American President Woodrow Wilson to reverse America’s previously neutral status during World War I and enter the war, thus ensuring victory for the Allies. What is The Zimmerman Telegram and how did it lead to America joining the allies in World War One?